-but not including his brief tenure as fan-turned commentator in the Megazine’s ‘top twenty’ list. A handful of one offs. But really, he’s a Dredd (and Dreddworld) man through and through. Consistent goodness at writing Dredd tales. 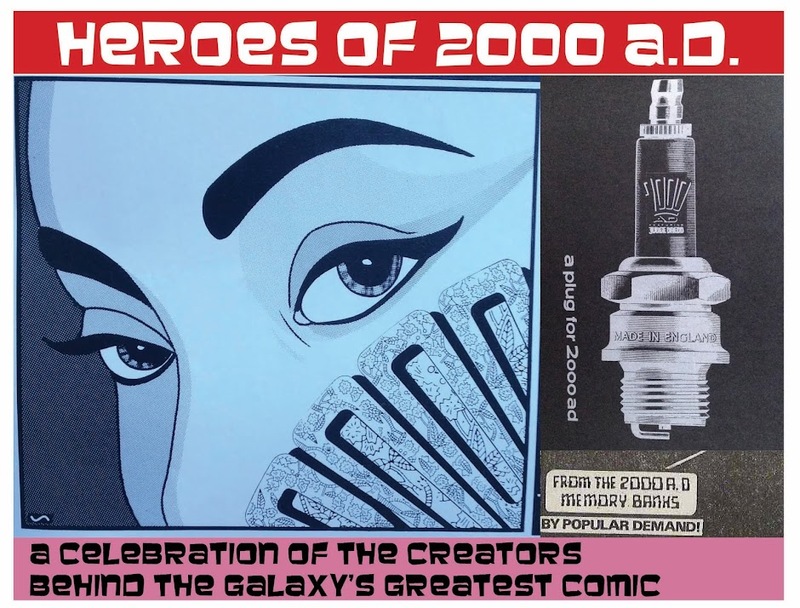 Combining an encyclopaedic knowledge of the strip’s past with a willingness to push new ideas and characters into the mix. Deft comic touches. Bringing out the context of the wider world in Judge Dredd, not just Mega-City 1. Carroll isn't shy of blasting holes into JD. There’s a formula to these things that means it’s not really fair to single out anything in them as Carrollian tricks or tics, but I would say that if there’s something that comes across, it’s extreme 2000AD competence. It’s almost as if he’s got access to some secret playbook that says ‘this is how you do it’. As it is, not every twist ending was mind blowing, but the premise is the thing. So, we get a Time travel story about Hitler (groan) – but this time it’f rom Hitler’s point of view (oooh, fun!). A Logan’s Run riff that opens with a lovely bit of 2000AD cynicism. Feeding the hungry? What kind of idiot would try to do that?! You can almsot see it, can't you? Dredd done right when he's on panel, too. It’s not that his streets ahead of his contemporaries or anything like that, it’s just he’s such a good fit. His recently-concluded epic (does it have an overall name yet?) provides a great example. Meet Thorn - who turned out to be a mew pawn of the real villain, but an impressive beast nonetheless! I mean, no one really thinks anyone but John Wagner will write a (the?) story in which Joe Dredd dies – but for a few weeks there, we kinda sorta believed that Carroll had been given the blessing to do the unthinkable. All that said, beyond the same most recent hyper-memorable storyline, I can’t actually call to mind many specific plots and adventures that he has put Dredd through. I remember Blood of Emeralds, but only to the extent that Dredd and Joyce went to Ireland and had a run in with some evil Brit-Cit Judges, and it sorts of relates to the long real-world history of the English being bastards to the Irish, but I don’t remember the actual specifics. Which might come across as faint praise, but to be honest I can’t remember much specifically from even John Wagner’s work on Judge Dredd over the last 15 years. I know it’s all been great, but epics aside, I don’t have the recall powers that I do for the stories I read again and again (and again and again) as a young squaxx with a limited set of Progs. 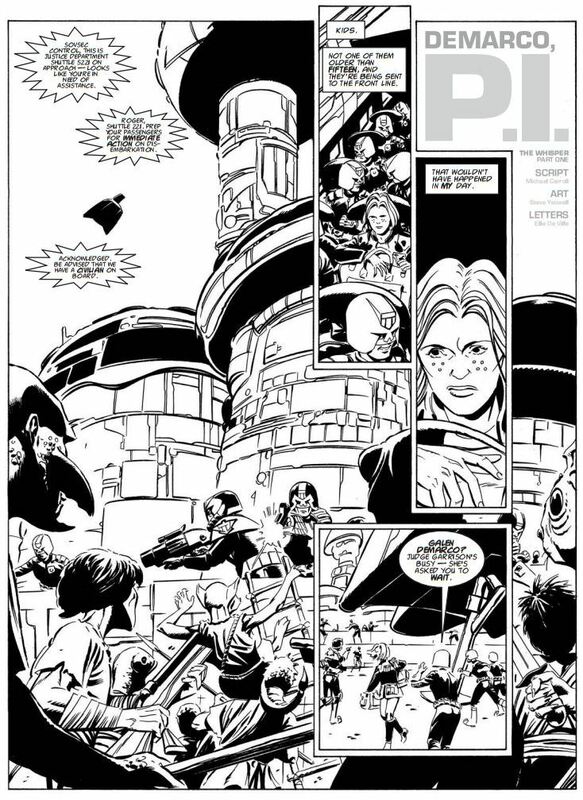 The most obvious point of discussion is Carroll’s willingness to pick up and run with elements of Dredd’s world. I guess you could say he’s following in Gordon Rennie’s footsteps. As if he’s picked up the baton of ‘natural successor to Wagner’ from the same man (obviously this is silly, as Wagner himself is still the driving force, and the likes of Ewing and Williams have been pretty drokking great on Dredd, too). What has Dredd ever done for MC2? to Emerald Isle and Brit-Cit, to a whole new construct on the much-ignored Pacific Ocean, the Gyre. He’s also made frequent use of Rico and Dolman, Dredd clones that Wagner likes to tease us with but not bring in too often. Sideways of Dredd he’s tackled DeMarco and, most recently, brought in Armitage. Most delightfully, there’s the all new Fintan Joyce, because why shouldn’t Ennis’s 2-year run on Dredd get some love as well? And because young Joyce turns out to be both funny and serious in equal measure. As anyone who’s heard him will know, the man gives good podcast. Before he turned pro, he wrote a series of fun fan articles for the 2000AD Review website, under the name Sprout. That site may be gone, but the Sprout Files live on! Judge Dredd: hell, I’ll just go ahead and say all of it. When Carroll’s name is in the credit box of a Dredd, you know it’ll be a cracker. *And not forgetting that he’d been writing Sci-Fi/adventure stories for a while at this point, too. **Or of course co-creator Pat Mills, who has ever trod his own path with this particular character. Thorn isn't any more likely to show up again than Oswin, for the same reason ... and at least Oswin had her own brain/personality. You make a fantastic point about the stickiness (or lack thereof) of stories you read as an adult then put away on a shelf beside thousands of other books and comics - because you have to do the dishes - versus being able to remember the story turns and character names of the same few dozen episodes you read again and again over long Summer holidays with nothing else to do. I can remember the smell of the garden wafting through the open door and the feel of the sun falling on me and the comic pages sprawled across my green checked duvet every time I pick up an issue from the 520-536 period. I read those stories like the Gospels. Great blog, Alex, and thanks for the link to Carroll's musings on the undeath of Johnny Alpha. Given the way Thorn was created, I hold out hope that a copycat version could be made at some point in the future! Basically I'm a sucker for giant slabs of beef in hockey masks. My gospel period (definitely stealing that phrase!) covers not so much the Progs as the Best Of 2000 AD Monthly Nos 6-32, with a handful missing in between. Good times!